UPDATE – 16 FEBRUARY 2019 – Bob is pleased to announce that all of his book titles are now available in ebook format! Please contact the author directly for information and ordering. Bob Piekiel has been a fixture in amateur astronomy in CNY for many years, both as a lecturer for local astronomy clubs and as the host of public viewing sessions at Baltimore Woods Nature Center and Green Lakes State Park. For questions or purchase inquiries about his many books, contact Bob at piekielrl _at_ netzero.net. A fully illustrated text describing how to accurately test the optics of any CAT with easy-to-make tools. Covers Ronchi, Foucault, and diffraction tests, plus a WHOLE lot more. There are chapters on bench-testing and how to identify problems in the individual optical components (primary and corrector, for example), and also more advanced sections for ambitious ATMs wanting to learn secondary hand-matching procedures, as done by the master opticians in the big shops. Profusely illustrated with REAL photos of scopes under tests. No computer-generated images or hand sketches. Very little math is used. This book is for EVERYONE. Forward by noted SCT enthusiast Rod Mollise. I actually wrote this 74-page book at the request of readers and fellow astro-buffs. It explains in easy-to-understand terms what SCTs are and how they work, and a lengthy chapter simulating (with the use of ATMOS optical design software) what happens to SCT performance if the optics are altered, moved, changed, re-positioned, etc. This can make everyone, novice or expert, understand more about the optical characteristics of SCTs. A straightforward guide to basic and advanced collimation of these popular scopes. Not only is secondary adjustment described in detail, but also primary mirror alignment and corrector centering. Details of easy-to-perform tests that determine if collimation problems are coming from something other than the secondary mirror, and how to handle them. Fully illustrated with REAL photos of scopes under examination. No computer-generated images or hand sketches. THE 1800-page Bible of SCT development, on CD-ROM. Chronicles the history of the commercial SCT from a back corner of Tom Johnson’s shop to the more modern scopes found today. Heavy emphasis on mechanical design and optics. TONS of full-color photos and engineering prints, many never before seen until now, with detailed repair procedures and extensive interviews of early Celestron opticians and engineers, including Tom Johnson himself. Any telescope buff or AstroMart user can highly benefit from this ebook. Whether you’re an ATM, a telescope user, equipment buff, optician, engineer, history buff, library curator, or an owner/user of an SCT, pick up a copy of Celestron The Early Years. Endorsed by Dennis DiCicco of S&T. This 320-page book is a guide for the more advanced ATM who wants to learn more about making SCT optics – primaries, secondaries, and the corrector plates. For those who were always interested in SCT optics but never gave it a try before, this book is for you. It takes the reader step-by-step through the phases of designing (or copying) optical components of SCTs through the use of basic optical math, and then instructs the reader how to turn these calculations into physical optics through the use of spherometers and other measuring devices. The chapters cover the use of optics software TDESIGN and ATMOS, also manual calculations, the ability to make optics from scratch, copy existing optical components through careful measuring, and also back-engineering SCT optics. Testing techniques such as Foucault, knife-edge, and Ronchi methods are discussed, as well as the use of Hindle spheres and Gaviola lenses. The text deals extensively with the use of petal tools and laps, for grinding and figuring correctors and secondary mirrors. Specialty computer programs for easily drawing petal laps are shown, and various techniques on how to use them (NOTE: Schmidt’s original vacuum-pan method is NOT discussed here and only briefly mentioned, as there are other texts that deal with this method exclusively). How to read fringes, hand-matching the finished system, making correctors, primaries, secondaries, the use of computer software, going back and forth between match and optics vs. optics and math, optical flats, hardware, special testing setups, etc. This book deals with the way finderscopes are built and designed, how to calculate magnification, exit-pupil size, and field of view. It explains how large finders can be made inexpensively using surplus lenses and ordinary, hardware-store materials. Covers specialty units like solar finders, illuminated reticles, also crosshair repair and other useful topics to allow you to easily upgrade your existing finder to make your viewing experience more pleasurable.. Even if you’ve never made a telescope, making a finder is EASY! If you want to do woodworking in your home, you probably need a table saw, a drill press, and a sander. If you want to be an electrician, you probably have a toolbox containing a multi-meter, wire strippers, and cabling tools. If you want to be a mechanic, you probably have a socket set, a car jack, and an impact wrench, just to name a few things. But what do you need if you want to do optics work in a home shop? Optics work can be very time-consuming and exacting. Dedicated amateurs can often produce optics that rival or exceed the quality of production telescopes, simply because they can spend much more time getting them exact. How can this work be made easier? One way is to equip your shop with various tools and devices specifically tailored for optical work, something that you probably won’t find at the local hardware or your neighbor’s garage sale – or will you? “The ATM’s Guide to Setting up a Home Optics Shop” is a non-technical books that lists and describes a variety of specialty items that you can buy or build, many at low cost, to greatly help in making optics work easier and more fun. 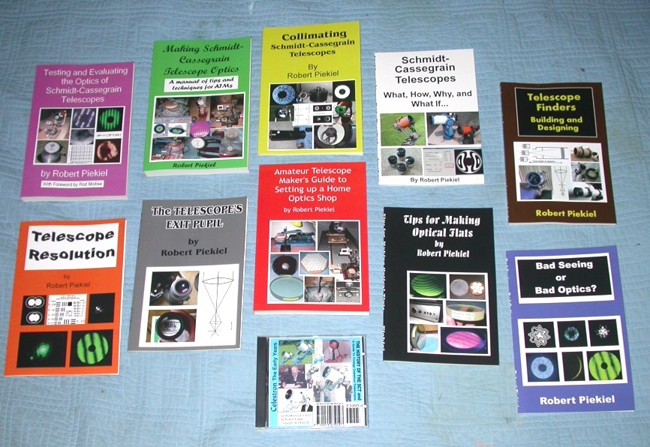 It is DIFFERENT than all the other books on telescope making. Rather than teaching you HOW to make telescope mirrors, this book shows you what you should have at your fingertips to greatly streamline your efforts. This book talks about flats and nothing else. Why would you want a flat? A flat makes it a cinch to test and evaluate your optics while working in the comfort of your heated home. No more star tests in the freezing cold. No more setting up artificial stars 300 feet away from you telescope. No more “nothing to do” on a rainy or cloudy night. So go ahead – make a flat! It might be easier than you think. Even if you don’t want to make your own, this book will advise you in purchasing one. If your scope delivers great images one night and poor images the next, it is probably due to bad seeing conditions, either near the scope, in the neighborhood, or high in the atmosphere. This book will help you identify such problems. Do you or your companions have trouble viewing images in certain telescopes or with certain eyepieces? The problem is most likely caused by the exit beam coming out the eyepiece not matching up with your own eye. This small book explains how this happens, and what to do to help the situation. If you order 2-3 books, shipping is a flat-rate $6 in CONUS. Order 4-6 books and shipping is a flat-rate $12 in CONUS. NY residents add 8% sales tax.